This title is directed primarily towards health care professionals outside of the United States. Nursing practice needs to be informed by an understanding of people and the societies in which they live. 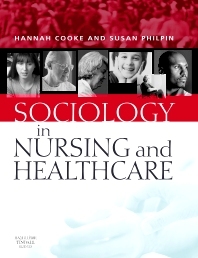 This introductory text has been designed specifically to discuss those aspects of sociology which are most relevant to nursing and the health care context in which it takes place. Introduction. Thinking sociologically about families and health. Thinking sociologically about religion and health. Work, professionalism and organisational life. Social class, poverty and health. Inequalities and health disadvantage. Healthcare policy and organisational change. Power and communication in healthcare. Nursing and nursing professionalism. Partnerships and care in the community. Understandings of health, illness, risk and bodies. Lay understandings of health and risk: a changing picture. Experiencing ill-health. Social responses to illness and disability. Death and dying.